If you enjoy fishing, look no further. 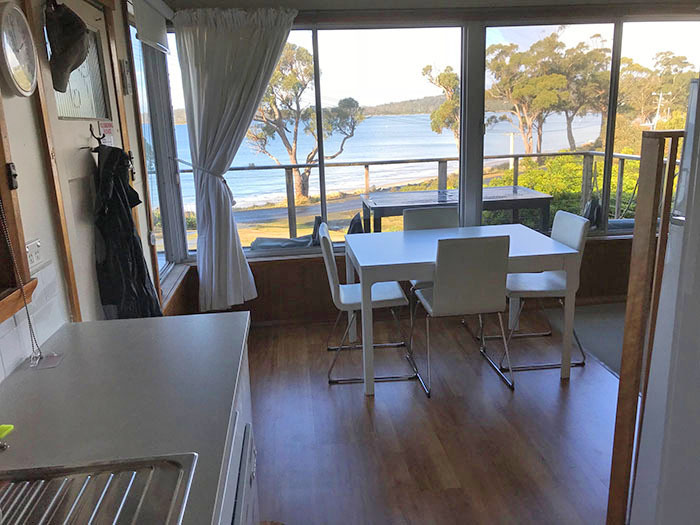 Beachfront accommodation with flathead & squid fishing right outside! How good is that? Stunning Beach right on your doorstep! Should you be blessed by great weather, stroll down to the beach and enjoy. On colder days, enjoy stunning views of the ocean. Check out our Gallery to see the views that you will enjoy from the decking, as well as our proximity to the beach and ocean. Summertime Cottage is the ideal location for a relaxing break away with or without the family! Relax in laid back shack style with only a bottle of wine between you and the beach. Light the fire, drag over a couple of easy chairs and kick back… This spacious abode combines comfort and convenience with an outlook that is to be envied! Stunning views from inside and out as you take in the absolute beauty and quiet activity of Southport’s bay. The beach fishing is second to none. A fishing rod will soon have a couple of good sized flathead in the bag. Squid can be caught from the end of the jetty at night, under the light. Huge Oysters and mussels can be collected off the rocks past the boat ramp at low tide. Whether you are after a romantic getaway, a great family holiday or a week’s fishing, your dream holiday awaits you at Summertime Cottage. Chill on the outdoor deck or enjoy the living room open fireplace. 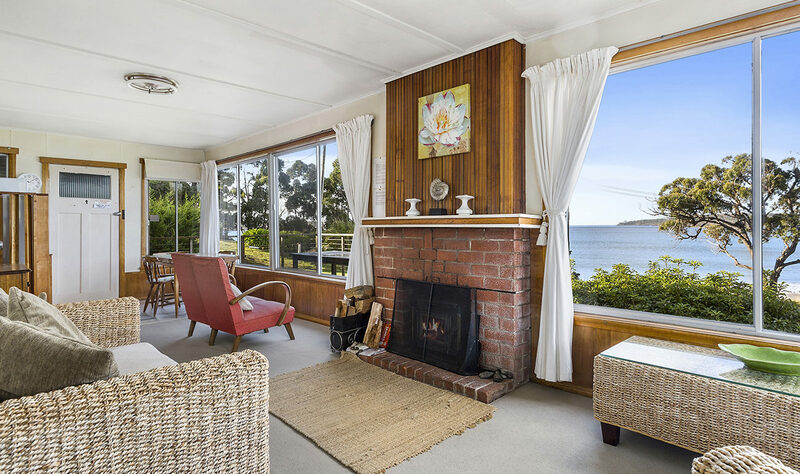 Our Cottage-Style Accommodation in Southport, Tasmania is an absolute beachfront home. 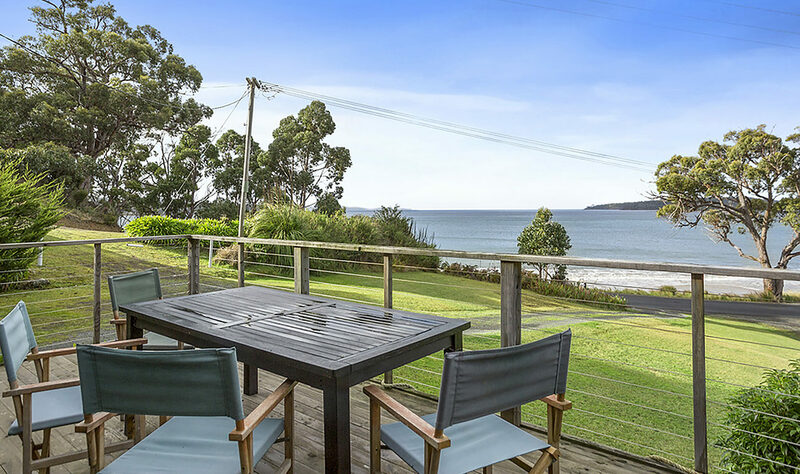 Comprising of 3 bedrooms, one bathroom, wood-fire heating and a large deck overlooking the ocean and an amazing sunset, this accommodation provides year-round charm for those looking for an intimate or simply tranquil getaway. Contact us to find out, more information. WoW! What a dream time we have experienced. Ample accommodation (ourselves and another couple) and all we needed. Charm, silence, beautiful sunrises and sunsets. Fresh fish and oysters … if we peservered!! Swimming, walks along the beach … enough fresh air and exercise ( and the obligatory ‘bubbles’) to start us off for the New Year. We will definitely be back! The spot with sea views (and the day bed with a view!). Also the main room was really pleasant to sit in and we thoroughly enjoyed our stay in the cottage even though it was cold and rainy most of the time! Beautiful and relaxing. We saw dolphins jumping in the bay from the front windows, and caught flatheadoff the beach right in front of the house. The estuary nearby was a great paddling spot for our baby. BOOK ONLINE: $249 per night.